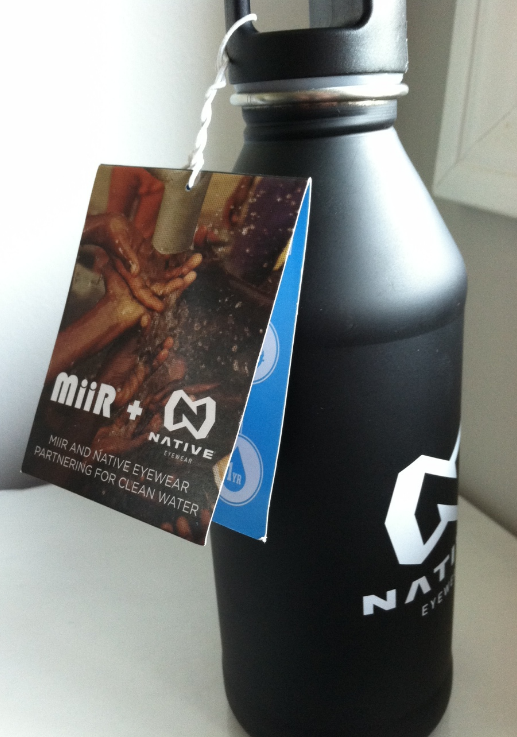 I got my new MiirR water bottle the other day and first noticed the great tag explaining the humanitarian benefit purchasing a MiiR bottle does for the less fortunate around the world. The next thing I noticed was the QR code on the back of the tag, which provided me with exactly what I was looking for after reading about this highlighted cause. When you purchase a MiiR water bottle you are helping to provide one person with clean water for an entire year in Africa. In fact, inside the bottle is a bracelet with a number that allows you to go online and see what community actually benefited from the new clean water made possible by your purchase. The tag on the bottle highlights this fact, but there is only so much on the tag. If you are anything like me and you see this claim, or are made aware of a serious humanitarian issue, you will likely desire to learn more about it. 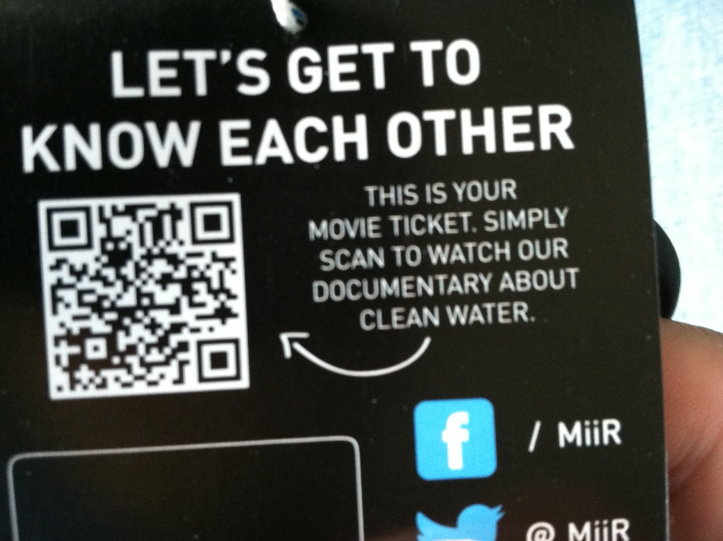 Luckily MiiR had the great idea to place a QR code on the back of the tag to ensure that curiosity does not go to waste. 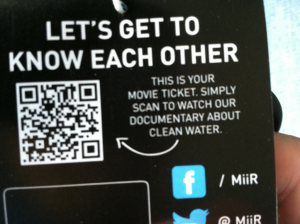 The QR code has a fantastic call to action, “This is your movie ticket. 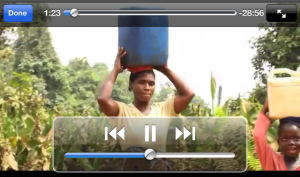 Simply scan to watch our documentary about clean water.” This call to action easily clears up what you will get upon scanning the code: a video on the importance of clean water and what can be done. This use of a QR code is a great way to help educate consumers about serious humanitarian issues, and provide the information to consumers at the moment they are most likely to have your attention and be interested in the issue at hand. The QR code and call to action is done very well, and the linking video/landing page, though not mobile optimized, lets you simply click on the video and be taken to the YouTube mobile optimized video documentary. 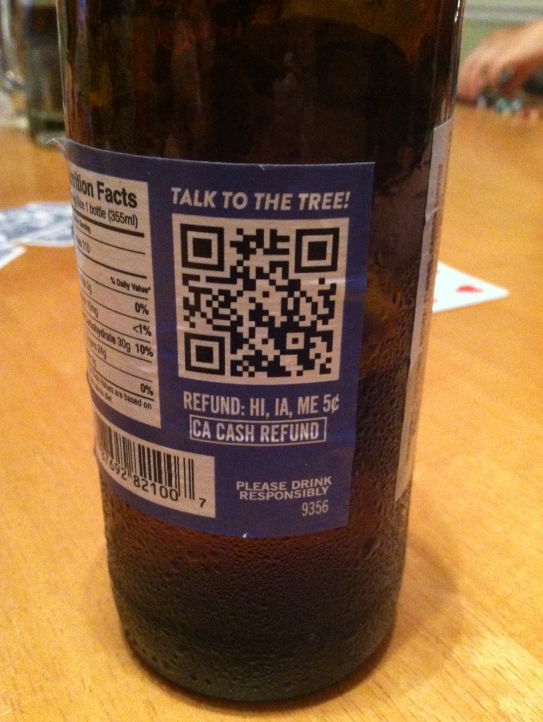 This is a great example of good QR code use helping to provide additional information to a customer. And though its purpose is mainly to bring awareness to this important cause, it may also help in driving sales by helping the MiiR bottle stick out over other competitors. I am sure many people would choose to purchase one bottle over another if they knew that the purchase of one would mean they are directly benefiting someone in need on the other side of the world. There is a time and place for QR codes, and product packaging is certainly one of those. Just be sure that when you decide to use QR codes you do so properly, and are providing real value like we see from MiiR above. Also be sure to use a platform that will let you manage your QR code campaign in one place, ensure you comply with best practices, are able to track all scan data, and is inexpensive. Want a way to increase the efficiency of your restaurant? 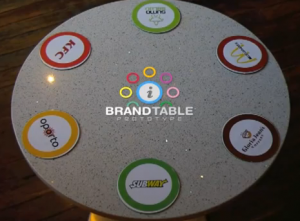 Brand Table might be the way. 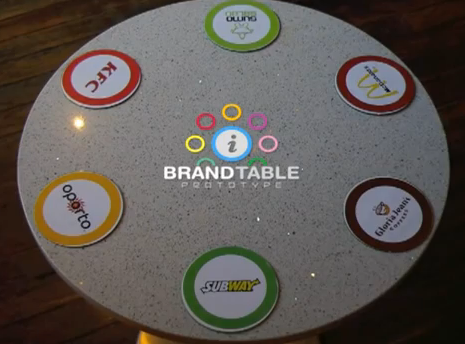 Using NFC technology Brand Table has come up with a creative way to make ordering easier and more efficient for both the customer and business. Let’s say you are in your local mall food court at lunch time. You look around and see lines at all your favorite dinning locations. You can either choose to wait in the long line, or leave the mall and go eat somewhere else. In this situation, both you (the consumer) and the business lose out. What if, on the other hand, instead of having to wait in line you could simply scan an Branded NFC tag of your favorite fast food joint at your table and place your order right there on your smartphone. No waiting in line! You save the wait time, get to eat your favorite meal, and the restaurant doesn’t lose out your business. It’s a win-win. On top of this, you place your order on your phone and pay right on your phone as well! This again saves you the time it takes to stand in line to pay and also saves the business the time it takes for the employees to ring you up. Perhaps now, instead of needing two employees to ring people up at busy times, they may only need one, reducing payroll costs. As soon as your meal is ready you are sent an alert and you simply head to the counter, show them your receipt (which was sent to your phone when you paid) and grab your food to go. Everyone is happy, the process is far more efficient, the business didn’t lose your order because of your lack of patience, and overhead costs for the business may have even been less since fewer workers needed to be paid to get you your meal. Economic progress at hand! The market is a beautiful thing. This is a great example of the possibilities of NFC technology and now that a majority of Americans have smartphones and NFC enabled phones and tablets, there is little excuse not to figure out how this technology can help your business and improve the experience of your customers. Just make sure you use a platform that will let you manage your NFC tags in one place, provide analytics and help to ensure you are following general best practices. 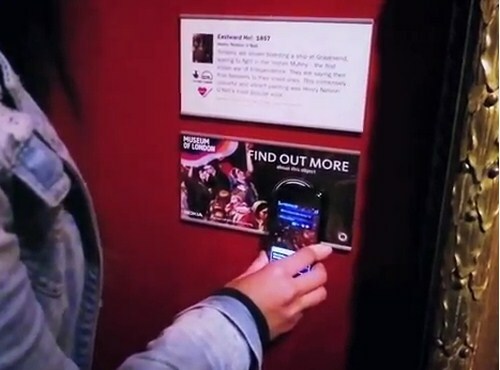 The Museum of London was ahead of its time when they decided to begin using NFC technology, but it wasn’t just the use of it that was ahead of its time, it was also the way they used it. 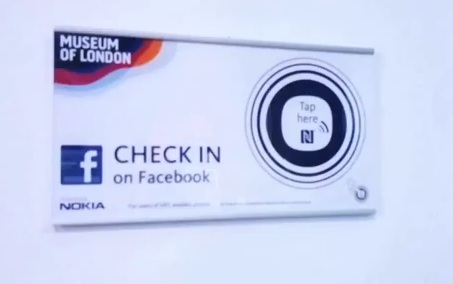 The many uses of NFC at a place like the Museum of London (MoL) are almost endless. For just one example, the MoL has made many of their exhibits interactive by including NFC tags in the actual exhibit, so the visitor simply taps their phone to the tag and is taken to videos, audio, games, or other information about whatever it is they are viewing. This helps to make the visitors experience far more interesting and enjoyable, and hopefully leading to more visits in the future. Besides this more obvious use of NFC mentioned above, the MoL is even more ahead of the game in some of the other ways they have used NFC. 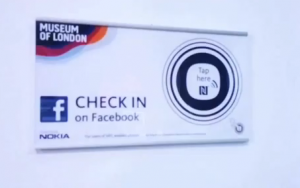 For example, they have placed NFC tags around the museum that allow visitors to instantly ‘follow’, ‘like’, or ‘check-in’ to the MoL on social media sites like Facebook, Twitter and Foursquare simply by taping their phone to the tag. This is a fantastic way to create inexpensive high quality advertising for the Museum. Other ways the museum has used NFC is to give vouchers and coupons to customers if they simply tap certain tags. These vouchers and coupons can be used in the MoL’s gift shops or cafes. They also have tags that upon accessing can let you download the Soundtrack of London which is an App that takes you on a musical tour of London while you walk around the city. Or you can use the NFC tags to donate to the Museum and purchase a ‘Year of London’s history Timeline’. This puts your name and caption on the year you adopted on their large timeline that runs through the museum. So as you can see the Museum of London has really gone all out in their use of NFC and they did so before it was a well known technology. These creative ways that they used NFC should be a great example for other museums and similar organizations to begin adopting. Creating more ways for customers to interact with your brand, information, or providing them with some added value or special deal, is a great investment for your business or organization and ignoring this, particularly now that more and more companies are already on board with NFC, is likely to stifle your future growth. If you are going to begin using NFC technology just make sure that you have a platform that will help you manage your many tags in one place, track the usage data and ensure you are complying with best practices. So there I was Ace, King in hand and I was all-in pre-flop going up against a Queen, Ten off suit during an intense poker night. Flop came with nothing. Turn came with nothing. River hit a Queen, and my night was over. Rough. 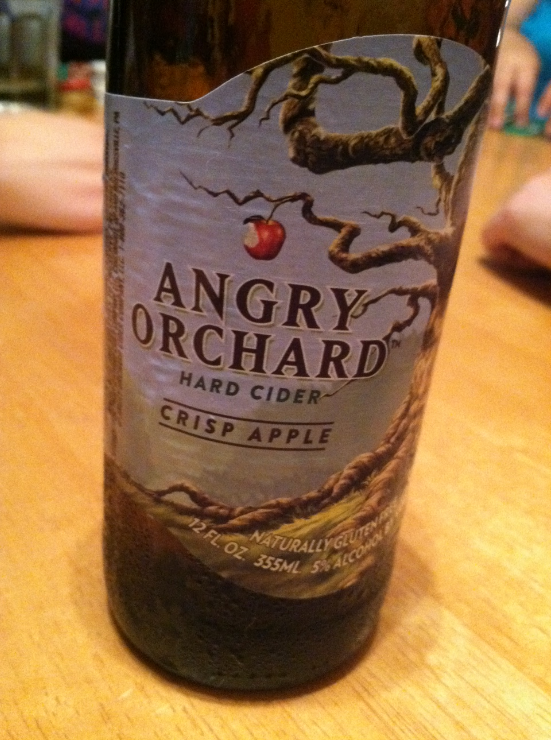 Luckily I was then handed a Angry Orchard Hard cider for the first time, and found it quite delectable. My night had just taken a turn for the better. One of the first things I noticed about the Hard Cider bottle was the QR code on the back. My first instinct was to assume it was a lousy QR code use like you might see on many other alcoholic bottles out there, but the good call to action convinced me to scan it nonetheless. I was pleasantly surprised. 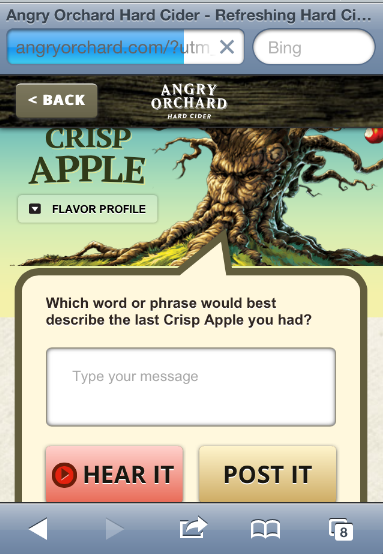 Not only did Angry Orchard have a solid call to action, they also had a mobile optimized landing page, and a very good looking one at that. These two things alone usually are enough for satisfactory QR code use, but even more than this they had a creative and interactive landing page, making it one of the better QR code uses I have seen. Typically most companies will simply link the QR code to their desktop webpage or, if they are slightly ahead of the curve, their mobile optimized home page. This doesn’t do a whole lot for the customer or the business. What works best is if there is some purpose for the customer at the landing page, ideally something interactive or some sort of offer. 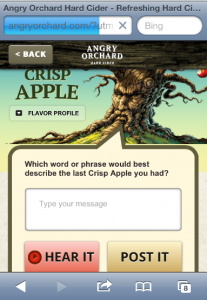 What I discovered by scanning the Angry Orchard QR code was a landing page that let you post what you thought of the Hard Cider you were drinking and post it for the world to see. This is a great QR code use because it allows the customer to interact with the brand and promote the brand to others on social media, giving them an inexpensive advertising medium, and hopefully a solid ROI. It is creative uses like this that more companies and organizations need to start utilizing, otherwise you are losing out on customer interaction with your brand and potentially sales. Just make sure you are using a platform that will ensure your QR campaign is running efficiently, you have all the data you need to learn from your campaign to adapt it to changing conditions, and allows you to manage it all in one place. Many parts of the world are years ahead of these United States when it comes to NFC technology and its adoption. Japan in particular stands out among these countries. 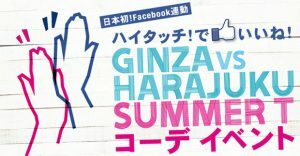 American advertisers and marketers might stand to learn something from the Land of the Rising Sun. Perhaps this blog will do just that, and be an inspiration for your creativity. 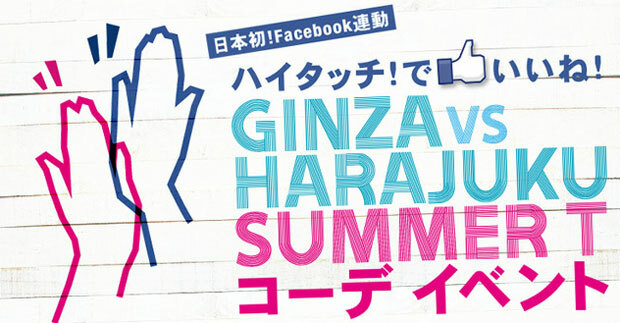 This latest NFC example comes to us from two of GAP’s flagship stores in two of Tokyo’s districts. The campaign was in effect a fashion contest between the two store’s employees, with the judges being the consumers. How this marketing campaign worked was that every customer upon entering the store was given a NFC enabled bracelet which was connected to their Facebook account. The customer was then directed to high-five any store employee whose attire they fully approved of. When they high-fived the employee the employee would high-five back with their smartphone, touching the NFC tag bracelet to the smartphone, a cheering sound is then triggered, and the vote for that outfit tallied. At this moment a photo with details of the particular outfit is then sent straight to the person’s Facebook timeline for the world to see. For participating in this fun fashion and marketing campaign the customer is given a free bracelet (not the NFC tag bracelet, but a different one), and a 20% off coupon. The ROI for a simple, inexpensive marketing campaign like this must be impressive. Implementing these sorts of creative ways to engage consumers and drive advertising and sales is not very difficult. Of course it is certainly atypical here in these United States, and so there might be some push-back when these sorts of ideas are brought up. Overcome the push back and you will surely be happy with the outcome. Of course using a platform to help ensure your campaign meets its potential is key to this success.